Wildflowers and Mexican cuisine at Roberto’s Café. Ahh, summer, it’s a great time to get outside whenever and wherever you can. This includes cocktail hour and mealtime, of course. Whether you want to sip sangria while munching on Mexican food at sunset, or enjoy a brew with a spectacular view, dining al fresco in the summertime just can’t be beat. So, grab your flip-flops and your shorts and enjoy these top 10 spots to sip and savor summer in Mammoth Lakes. 1. 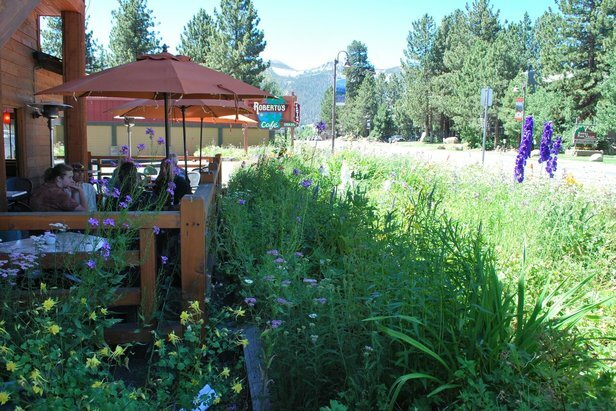 The Lakefront Restaurant: The Lakefront Restaurant, one of Mammoth Lakes’ delicious fine dining spots offers a special treat in the summer only—lunch on the patio, every day, all summer from 11 a.m. to 2 p.m. Enjoy the serene beauty of lower Twin Lake, in the Mammoth Lakes Basin, while your taste buds are treated to cucumber and marcona almond gazpacho and a pork belly burger or some fried chicken. Indulge in the Lakefront’s great wine list and let the afternoon slip into a relaxing summer evening. 2. Mammoth Brewing Company and The EATery: Local brews paired with delicious food and great views make Mammoth Brewing Company’s beer garden a top spot for outdoor summer dining in the Eastern Sierra. Grab a pint of the award-winning double nut brown to go with your braised beef oxtail over tots, topped with a fried egg, and you’ll swear you’ve died and gone to heaven. Grab a picnic table in the outdoor beer garden and drink in views of the Sherwin Mountain Range. Bring your (leashed) pup too, the beer garden is dog friendly! 3. Gomez’s Restaurant and Tequileria: Located in the Village at Mammoth, Gomez’s is home to the Mammoth Margarita as well as a great outdoor dining deck, complete with a sandbox for the kids. Enjoy nachos grande and some sizzling fajitas while you check out the restaurant’s massive selection of tequilas: 500 plus bottles to choose from! 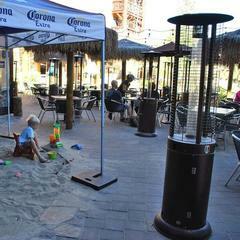 Often, you can pair your Gomez’s dining experience with live music and events taking place in the Village. Dog friendly. 4. Mammoth Rock ‘n’ Bowl: Step into the Sky Lounge at Mammoth Rock Brasserie for fine dining and a bird’s-eye view of the mountains that make Mammoth Lakes so beautiful. Let chef Frederic Pierrel treat you to spectacular cuisine paired with specialty cocktails or the perfect wine. Don’t miss the duck confit or the elk medallions while you enjoy views of Mammoth Mountain and the Sherwin Range. Plus, after you have your fill, you can go inside and bowl a few games or stick to the fresh air with a round of horseshoes. 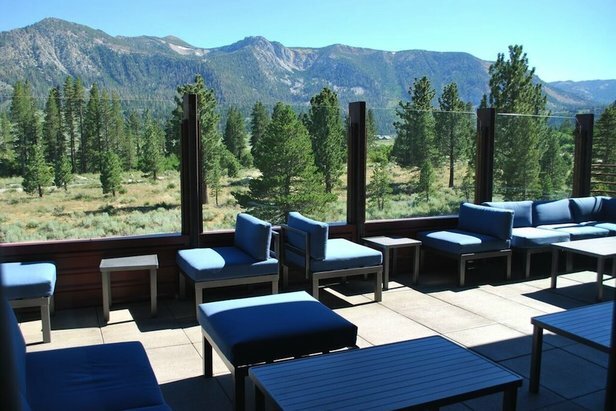 Step into the Sky Lounge at Mammoth Rock Brasserie for fine dining and a bird’s-eye view of the mountains that make Mammoth Lakes so beautiful. 5. Roberto’s Café: Surround yourself with beautiful wildflowers while you enjoy Mexican cuisine at Roberto’s Café. 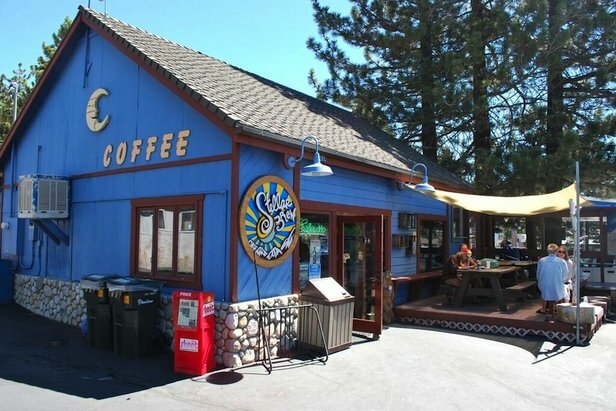 A family owned and operated restaurant in the heart of downtown Mammoth Lakes, Roberto’s is known for its happy hour, daily specials and beautiful outdoor patio. Roberto’s serves authentic Mexican dishes such as Chile Verde, Carne Asada, Carnitas, Homemade Tamales and Huevos Rancheros. Plus, they also offer a variety of Mexican seafood and vegetarian dishes. Dog friendly. 6. Stellar Brew: Fuel your next adventure with breakfast and lunch options at Stellar Brew. This cute little blue house on Main Street has a great outdoor deck, complete with an old-fashioned bathtub full of flowers. Start your day with a breakfast burrito or a tasty Basin Bowl full of organic brown rice, shredded organic carrots, beets, chopped kale, tomato, an over easy egg, organic lemon tahini dressing and stellar seedy herb blend. For lunch, try the Carnivore sandwich paired with some beer or wine. The Stellar Brew deck welcomes dogs of all shapes and sizes. Fuel your next adventure with breakfast and lunch options at Stellar Brew. 7. Yodler: Located at Mammoth Mountain’s Main Lodge, the entire family will enjoy an authentic European experience at Yodler, with its signature menu featuring brats, schnitzel, kid favorites and barbecue hot off the outdoor grill. Grab your favorite drink and hang out on the sundeck while you take in the spectacular mountain views. Parents can sit back and relax while they watch their kids climb the rock wall at the Adventure Center. Don’t forget to ask about their two-dollar beer specials all summer long. 8. Good Life Café: Whatever time of day it is, you can grab a meal at Good Life Café. Open for breakfast, lunch and dinner daily, Good Life doesn’t serve fast food—they serve fresh wholesome food as fast as they can. Offering a variety of menu options, plus beer and wine at great prices, you can start or end your day at the Good Life Café. Outdoor patio seating is available. 9. Side Door Café: Picture a relaxing moment with a crepe and a nice glass of wine after a day of adventure…that’s what Side Door Café is all about. 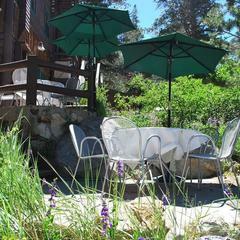 Providing Mammoth Lakes with a deliciously entertaining place to relax, meet friends and enjoy the summer air on the outdoor patio. Side Door provides a cozy atmosphere where customers can experience local culture while enjoying tastes from around the world. 10. 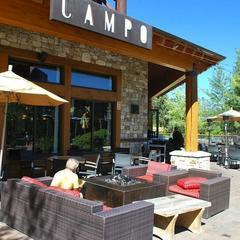 Campo: Looking for some rustic fare while in Mammoth Lakes? Campo Mammoth is a great place for dinner, happy hour or date night, with its wood-fired Neapolitan pizzas, farm-fresh products, and perfectly paired libations. 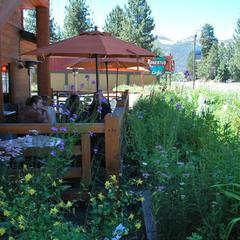 Enjoy all of this on the restaurant’s outdoor dining patio, located in the Village at Mammoth. With James Beard nominated chef Mark Estee at the helm, you’ll enjoy a menu full of local, seasonal ingredients and simple cooking. 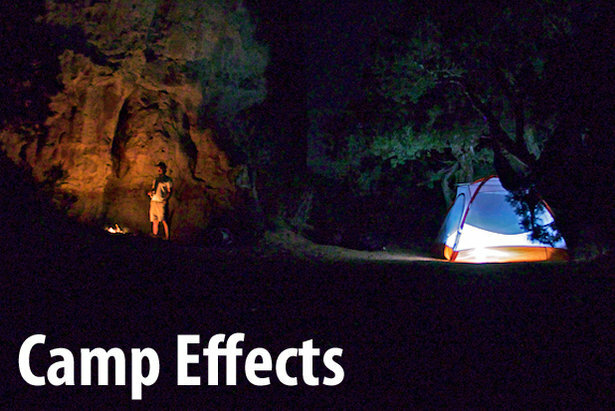 28 campsite comforts to make our weekends spent in the dirt as pleasant as possible.